Politics and the Life Sciences (PLS) is a biannual, interdisciplinary peer-reviewed journal with a global audience. PLS is the official journal of the Association for Politics and the Life Sciences, an American Political Science Association (APSA) Related Group and an American Institute of Biological Sciences (AIBS) Member Society. PLS publishes original scholarly research at the intersection of political science and the life sciences. The topic range includes evolutionary and laboratory insights into political behavior, from decision-making to leadership, cooperation, and competition; evolutionary analysis of political intolerance and violence, from group conflict to warfare, terrorism, and torture; political and political-economic analysis of life-sciences research, health policy, agricultural and environmental policy, and biosecurity policy; philosophical analysis of bioethical controversies; and historical analysis of currently misunderstood issues at the intersection of the social and biological sciences. 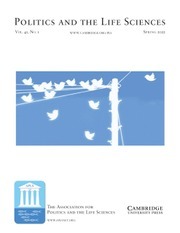 Contributors include political scientists, political psychologists, life scientists, clinicians, health-policy scholars, bioethicists, biosecurity and international-security experts, environmental scientists and ecological economists, moral and evolutionary philosophers, political and environmental historians, communications and public-opinion researchers, and legal scholars. Are press depictions of Affordable Care Act beneficiaries favorable to policy durability?